He's played characters like Snake Plissken, Jack Burton and even Wyatt Earp. He's been a Hollywood idol for more than half his life and has spent 35 years with one of Tinseltown's darlings, Goldie Hawn. But it's quite possible none of this would've come to pass had Kurt Russell achieved his initial dream nearly 50 years ago. Russell, 68, followed in his father's footsteps in more ways than one. While his dad was best known for roles in "Bonanza" and "The Magnificent Seven," he instilled in his son a love of baseball that carries on to this day. The elder Russell was a ballplayer himself, spending two seasons with the Carrollton Hornets in the Georgia-Carolina League, roughly the equivalent to short-season competition in today's game. In fact, his father -- who grew up near the Yankees' Spring Training complex in St. Petersburg, Florida in the 1930s -- became an unofficial team mascot of sorts and grew close with Joe DiMaggio and Lefty Gomez. The sport became a staple of the Russell clan and, like millions of other baseball-loving kids, a focus for young Kurt. In fact, a main reason Russell got into acting was because of baseball. When he was 11 years old, he auditioned for a role in the movie "Safe at Home" -- simply to have the opportunity to meet Mickey Mantle and Roger Maris. "Our family business was baseball, not acting," Russell said. "From the time my dad got to know the Yankees and his relationship with Lefty grew, that became the family business. My dad really wanted to play baseball when he was young, but he was hit in the head and that was that. He was interested in acting, so he moved in that direction instead. It's similar to my situation in a lot of ways, so I guess the apple doesn't fall far from the tree." Russell grew up in Thousand Oaks, California, which was, in his words, a "baseball hotbed." His father was instrumental in organizing the local Little League, gathering kids who not only wanted to play but were serious about it. "He loved passing on his knowledge of the game," Russell said of his father. "Baseball was what we were going to do. That was it. We had a batting cage in our backyard. In fact, that was our backyard. For my family, baseball was a year-round thing. Acting was a business for me like it was for my dad. I made money but I wanted to play baseball. That was the pursuit." Russell made his television debut on "Dennis the Menace" in 1962 and was already a successful actor by the time he was 20, having appeared in nine movies and numerous TV shows. But his baseball skills drew the attention of several Major League teams, including the Angels, Cardinals, Giants and Twins. "I was working on a Disney film at the time and the Giants and Twins were talking to my dad about drafting me," he said. "But I wanted to be able to finish the picture I was doing, even if it meant missing some of Spring Training. I had a few options to get my career going. I could play in Mexico, which might have been a quicker path, or I could go the more conventional route, which is what I did. I felt that was a wiser decision for me." Russell signed with Class A Short Season Bend in the Northwest League prior to the 1971 season. The Rainbows were a newly-formed team owned by the Triple-A Hawaii Islanders and Angels. He hit .285/.385/.363 in 51 games, primarily as a second baseman, and made the All-Star team. The club became the Walla Walla Islanders in 1972, where Russell again made the All-Star team after he batted .325/.389/.377 in 29 games. The future actor played alongside several notable baseball names during his two years in the NWL, including former Major League manager Tom Trebelhorn. "He was a lot like me ... just a smart player," said Trebelhorn, who managed seven years in the bigs with the Brewers and Cubs. "Kurt knew the game, he played it well and was a good teammate. He was a switch-hitter who could handle the bat pretty well and he just loved to play the game. He had a real passion for it." As teammates, Trebelhorn knew exactly who Russell was, as well as his -- at the time -- more famous father. "I met Bing several times," Trebelhorn said. "He would come out to watch Kurt play. We all knew him from "Bonanza" and even Kurt was a pretty big deal by that point. He was already somewhat of a teenage idol and his career with Disney was fairly significant. He wasn't the matinee idol he would become, but he was recognized. 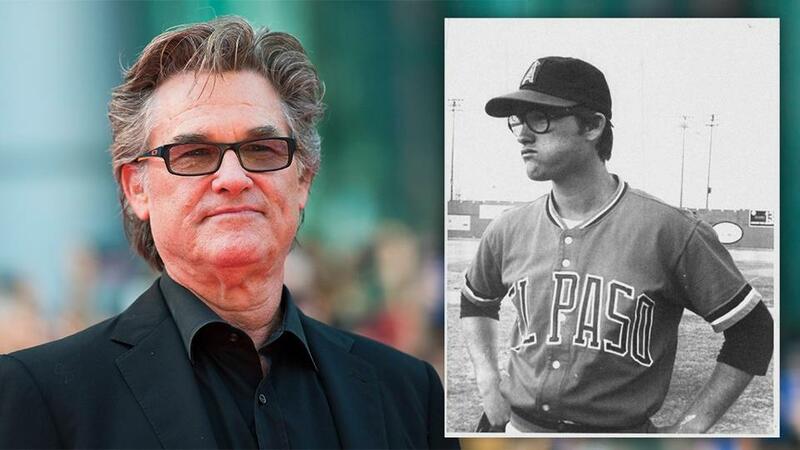 It was a pretty big deal for a bunch of kids just out of high school or college seeing Kurt Russell playing baseball in Bend, Oregon." Russell moved up to Double-A El Paso in 1973 and was off to a hot start before fate intervened. "I loved playing in El Paso. That was a great place to play and I was off to a really hot start," said Russell, who was hitting over .500 a week into the 1973 season. "I was trying to turn a double play at second base and a runner came in high and hit me hard. The pain in my right arm was pretty bad." Russell traveled to Los Angeles and visited Dr. Frank Jobe, who became synonymous with baseball and arm injuries, to have his shoulder checked out. Before the visit, El Paso teammate Frank Tanana -- who would win 240 games during a Major League career that spanned 21 years -- listened to Russell describe his injury and said it sounded like a torn rotator cuff. Tanana's uneducated diagnosis would prove correct. "Our family business was baseball, not acting. ... Baseball was what we were going to do. That was it. We had a batting cage in our backyard -- in fact that was our backyard. ... Acting was a business for me like it was for my dad. I made money but I wanted to play baseball. That was the pursuit." "The doctor ran some tests, looked at me and he said, 'Aren't you also an actor?' I said, 'Yeah,' and he said, 'Well, you're an actor all the time now," Russell recalled. "I sat there about 10 minutes, not knowing what to do. I was just devastated." El Paso released him in May 1973 so he could act while recovering. He was supposed to return to the Sun Kings later that season but instead joined the Portland Mavericks, a newly formed club independently owned by his father. The Mavericks became a sensation in the Northwest League, setting an attendance record and becoming the first team to hire a female general manager, Lanny Moss. The acclaimed 2014 Netflix documentary "The Battered Bastards of Baseball" chronicled the off-color history of the club and was directed by Kurt's nephews, Maclain and Chapman Way. "Bing was a good guy," Trebelhorn said. "He loved baseball and he loved the Mavericks. I managed against Portland in the Northwest League [with Boise in 1975-76]. It was an interesting experience, to say the least. But he was a good promoter and liked to have fun. It was good for the game and a successful franchise." Kurt was also named vice president of the Mavericks, making him the only professional baseball player to also be an executive of the same team. He hit .229 in 23 games and outside of a one-game appearance with Portland four years later, his career as a player was finished. "I helped my dad get things started [with Portland]," Russell said. "The Angels told me I could keep hitting but I shouldn't throw. They hoped I'd be fine the following year, but I knew my arm was done. I was finished. But the Mavericks were a great organization. It was fun being around the club and to be a part of its existence." While Russell would go on to become one of the most recognizable actors in Hollywood in the 1980s, his nephew, Matt Franco, carried on the family tradition of playing pro ball. Franco reached the Majors in 1995 and ultimately spent eight seasons in the bigs. "We've always been extremely close," said Franco, whose mother, Jill, is Russell's older sister. "I was born when Kurt was a teenager and he was around quite a bit. He didn't really become the Kurt Russell we all know until I was a teen myself, but he's always been more than an uncle to me. I'd say he's been like a brother or even another father in many ways." It goes without saying that baseball was in Franco's bloodlines, and the duo shared that passion growing up in Southern California. "Matt was a professional hitter and a good one," Russell said. "He deserved to reach the Majors and I'm glad he did. He was the third family member to play professionally, so I guess you could say the third time proved to be the charm. One of the greatest thrills for our family was seeing him play in the Subway Series [with the Mets in the 2000 World Series against the Yankees]. We rode the subway to every game and just enjoyed the whole experience." Franco and his uncle remain close to this day. "We both have a lot in common," Franco said. "We're cut from the same cloth in a lot of ways. He was a big part of my childhood, and that included playing baseball. He'd hit grounders to me and throw me [batting practice]. When I played in the Minors, he'd pop in every now and then and check in on me. It was the same when I reached the Majors. We talked baseball all the time. That was our thing. In fact, we still do today. Baseball was just something we grew up with and loved. "Obviously I was never on the same level of celebrity as Kurt was, but I've learned a lot from him. Even so, I don't look at him as a celebrity. I know he is but when you know him like I do, he's just a great guy. I'm really proud to call him a family member." Although Russell's baseball career ended more than 40 years ago, his love and passion for the game has never waned. Whether it's visiting Franco during his time as a pro or going to games as a fan, baseball is part of Russell and always will be. "Do I wish I could play one more year? Yeah," Russell admits. "But there's a difference in being injured or outright cut. My father and I were ousted from the game due to injuries. I don't regret anything except the injury itself. Playing more would have been great, but it wasn't meant to be. "Looking back, I'm tremendously fortunate to be where I am in my life. That baseball was a part of my story only adds to it. I'll always be grateful for those years."